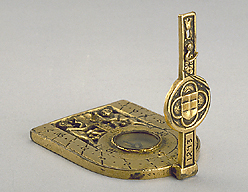 This string gnomon dial, dated 1453, is one of a group of sundials with similar features, but which nevertheless differ in some particulars. They appear to be the earliest string gnomon dials, and the first portable dials with compass and polar gnomons. They have been attributed to Georg Peuerbach and to his pupil Regiomontanus, but some doubts have been expressed on the authenticity of these instruments.